When someone hurts you, you’re supposed to forgive and forget. That is what good Christians do, right? The Bible does tell us that forgiveness is not optional for Christians, so we better get right to it. There’s nothing for it but to get it over with, right? So what you really need is a quick and dirty x-number of steps to forgive someone and move on with your life. After all, nobody has time to deal with a bunch of negative emotions anyway, right? They’re just going to hurt. 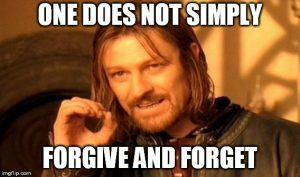 Telling a wounded soul to simply forgive and forget is tantamount to telling a couple of hobbits to waltz into Mordor and casually toss the One Ring into Mount Doom like it is no big deal. As Christians, we rush way too fast to forgiveness. People need to be able to process through their hurt and grief first and have ample time to bring it to the cross on their hearts’ terms before exploring the concept of forgiveness. Unforgiveness left lingering over time can cause significant problems, but there is no need to panic. Although forgiveness is not optional for a Christian, God has immense patience in our implementing it. There is no need to rush someone through their grief and scar them in an attempt to hurry forgiveness before the person is fully ready. If we truly believe we have the answer to human pain, why do we require our people to hide it and stow it away where it can never be seen? 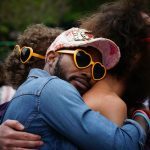 Rather than assisting a wounded person with their journey of healing, rushing to forgiveness without working through the pain and anger that results from the offense actually encourages the hurt person to bury these troubling feelings, denying their existence, and allowing them to fester and cause emotional, spiritual, and relational difficulties down the road. This is why we have so much brokenness conflict in the church: because hurting people hurt other people, and we do not encourage people to truly heal. Quite the opposite, in fact. 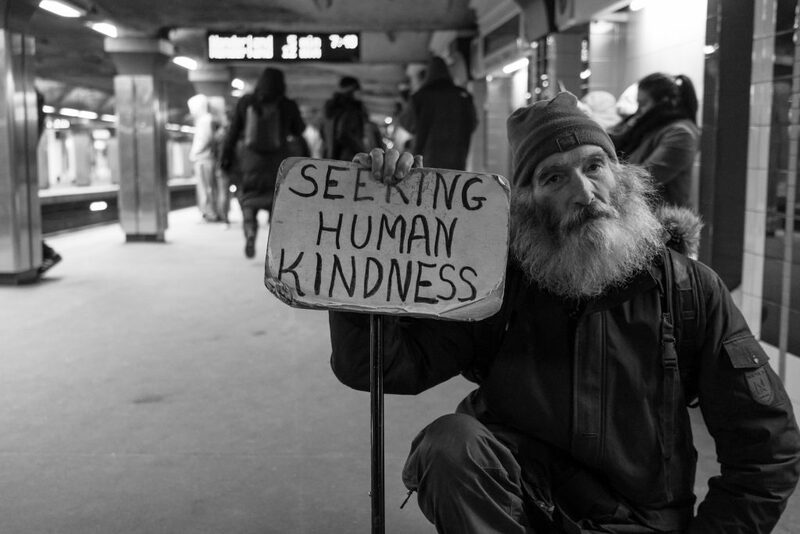 We often deny the existence of evil and fail to reach the most vulnerable in our world because their pain is more than we would like to encounter. If it is the truth that sets us free, the only way to set a wounded person free is by helping them tell the truth. But, the truth takes time to process, especially when it involves a soul wound. People may be sorting through multiple layers of hurt and they need time to realize, sit with, accept, and express their emotional, spiritual, and physical truth in the timing and ways that are appropriate to their personal grief journeys. Sitting with the truth is uncomfortable, and we must be willing to be a non-anxious presence there in that place with the people we serve. The goal of the journey is ultimately the foot of the cross, but we must remember that not everyone gets there at the same speed or even by the same route. People need ownership of their own journeys to the places where they find Christ. We do not get to take control of another person’s process. When we walk with a fellow traveler who is struggling, we often serve as a midwife, helping them labor and birth new life in their souls. Much like a mother giving birth, if we encourage a push at the wrong time, we can inadvertently make things more difficult for them rather than them making forward progress. As a matter of fact, like a good midwife or obstetrician, we may need to slow them down if they are frightened or wish to rush through so the pain will be over. I have a dear friend who walked with me as my spiritual director for a season. She did that for me. She slowed me down from rushing to forgiveness, and she encouraged me to stop trying so hard to pray for the person who hurt me. She told me to sit with my anger for a while. And when I did, I was really angry. I scared myself a time or two when I saw what was hiding behind my denial and compulsive need to jump to the final step of grief without touching my pain or grieving the sin of it all. But, that was how I really began to heal. It wasn’t until I let it all out in the open light in all of its naked, ugly, hideousness that I was finally able to grieve, heal, forgive, and move on. I’m currently still working on the forgiveness and moving on part. But, God has been redeeming the whole situation in ways I never even had the capacity to imagine. He is faithful, but we have to do our work! The glorious thing about the process of helping people sit with their truth and express it is that this, specifically, is how healthy testimony is formed. I can talk about things that happened to me now without the white-hot unbearably searing pain that I desperately wanted to avoid. I can actually talk about what happened without any feelings of guilt or shame and without overwhelming pain or sadness. Now, when I talk about those events, I mostly have a deep sadness for the sin. Now, because I can tell my testimony in a healthy and appropriate way, it can help others be free and to know they are not alone. My testimony can show the strength and compassion of the God Who knelt down, regarded my helpless estate, and gave his own blood to make me whole again. The entire gospel is what is at stake when we give people pithy sayings instead of being the Church, which is the living embodiment of Christ in the world. Now, here’s the end result of sitting with the hurt and anger, working through the grief, and dwelling in the midst of all that mess until you connect with the healing hands of Jesus. The more you abide in the truth and seek God in it, the more it shifts the way you remember the event. By seeking the Presence of Christ in that hurting place, you begin to see the event from his perspective. As your perspective shifts and your anger fades, you’ll no longer want to see the person who hurt you as a monster or an enemy. You will be more easily able to see that person as the son or daughter s/he is. You’ll begin to see that person as created in the image of God and in need of grace the same as you. Then you’ll find truly forgiving and letting go of your anger isn’t as impossible as it once seemed. In terms of forgetting, that is not only unwise but impossible. But, that is another article entirely. My Teen Would Never Do That! Patricia is the Coordinator of Alumni and Church Relations at Asbury Theological Seminary and the Managing Editor for Soul Care Community. She and her teenage son live and play video games together in Wilmore, KY. Patricia's passions are inner healing ministry, spiritual formation, cooking, writing, growing things, and teaching others how to have a vibrant prayer life. Such a good word- spiritually mentally and emotionally. Thank you for breaking it down.